Peter Parker arrives back in New York from a trip to Los Angeles (all I could think is I wonder if he went to Disneyland). Before he even leaves the parking lot he witnesses a young lady being assaulted by a group of men. These men are S.H.I.E.L.D. agents who are risking flying cars in the daylight in order to catch their prey. Spider-Man discovers that the victim is S.H.I.E.L.D. scientist Bobbi Morse, the Mockingbird. She claims to have information for Colonel Nick Fury. But Branch Director Delandan warns the webslinger that Morse actually wishes to assassinate the Director of S.H.I.E.L.D.. With a kill order on Mockingbird’s head, Spider-Man must make the difficult choice of deciding which side he is on! Readers are challenged in determining who to believe in this origin issue punctuated by plenty of fighty fighty moments that would make Adrianne Palicki proud to wear the goggles! Boom, I loved it! I cannot tell a lie. This issue was really great. There is plenty of fighty fighty with two extended action sequences to keep the thrill junkie’s attention. But we also get back-story on Bobbi and get to see her in action for the first time. So it makes a nice base for her to jump off from. Though the ending does complicate where it could go next for Bobbi. But one does feel whatever it was the story will include S.H.I.E.L.D. in its next steps. To pick up a copy of Marvel Team-Up #95, time travelers should to April 22, 1980, to score this issue right off the racks. Though it is dated July 1980. The story is written by Steven D. Grant who has over 227 story credits from both of the big two including several Spider-Man adventures. And Grant does a good job capturing Spider-Man’s voice. The cover is penciled by Legend Frank Miller, and it does a great job depicting the action within. So what can discover about Bobbi? Well, she was a S.H.I.E.L.D. scientist who may or may not have gone rouge. When she did so, she destroyed some S.H.I.E.L.D. research facilities. 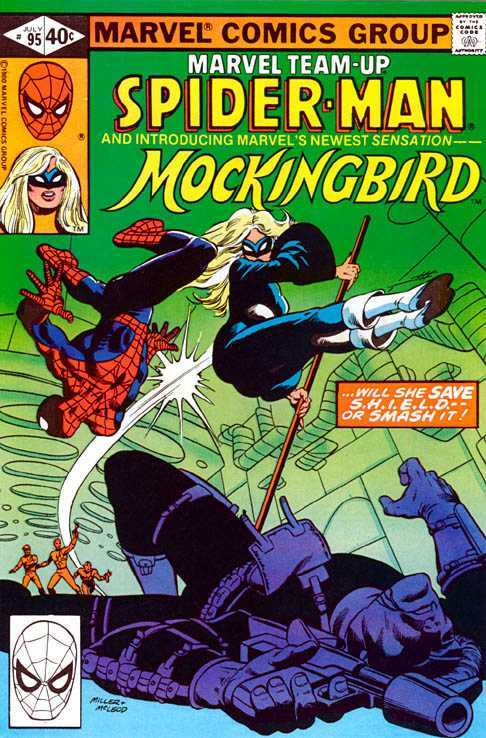 I will say good or bad, Mockingbird’s first appearance does tap into the theme of S.H.I.E.L.D. is always being betrayed from the inside! Bobbi wears a meshed cloth costume that is both stylish and fireproof. And she shows off her battle staves, which I love seeing in her first appearance, which she not only uses separately but she also locks into place as a pole-vaulting javelin. How cool would that be to see on Tuesday nights? Oh, and she was not always going to be named Mockingbird. Originally they intended for her to be named Huntress, a fact the story makes mention of. However, Huntress is a heroine over at that other company, so as they say, guess why the name had to be changed? Spider-Man likes Nick Fury! And when I say like I mean does not want to see him dead. Also apparently with the 1980 model of LMD, Spider-Man can tell the difference between live and Memorex! It truly was a very special Valentine’s Day. I spent it with my favorite people in the world. I got taken to see Kingsman. I pretended that Saturday morning cartoons still exist with the Junior Agents. And I got to dive deep into the history of my favorite super heroine with a story that I feel was a strong first outing. All and all a pretty good heart day!